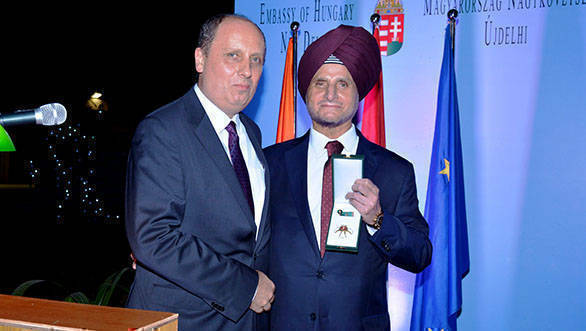 The Chairman of Apollo Tyres Ltd. Onkar S Kanwar, was recently awarded with the Officers Cross (Civilian Division) of the 'Order of Merit' of Hungary. This award was conferred upon Kanwar in recognition of his work towards strengthening Hungarian-Indian economic relations through the company's investment in Hungary, thereby helping create new jobs in Hungary. This decoration was first awarded by the President of the Republic of Hungary, Janos Ader, on the recommendation of the Hungarian Prime Minister. H E Gyula Petho, Ambassador of Hungary to India, officially handed over the 'Order of Merit' to Onkar S Kanwar in Delhi at a specially hosted reception. Apollo Tyres has invested Euro 475 million to set up the greenfield facility in Gyongyoshalasz, Hungary, which manufactures passenger car and commercial vehicle tyres. This facility currently employs 800 people, out of which nearly 95 per cent are locals. This is Apollo Tyres' second production facility in Europe, and sixth worldwide. The production capacity continues to be ramped up in this facility, and will reach the planned production levels for Phase I by 2019.